Finding out you’re pregnant can be both exciting and daunting. Suddenly, you need to worry about what you’re putting into your body, as well as the environment you’re surrounded by. There’s so many things you start to worry about as you strive to make sure your baby develops healthily in the womb. There’s also the potentially nasty side effects to think about, as well as the effect stress could have on both you and your unborn baby. It can be overwhelming and many moms-to-be are understandably confused as to what they should and shouldn’t be doing. 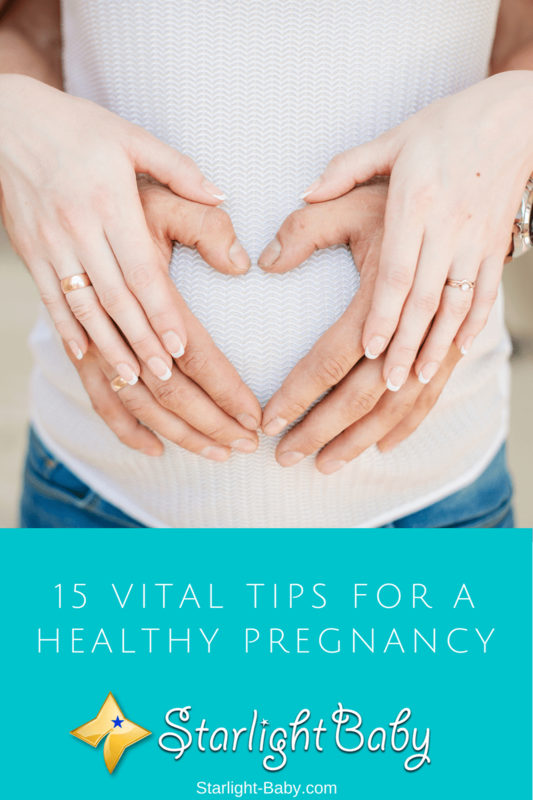 So, if you’re looking to enjoy a healthy pregnancy, below you’ll discover 15 awesome tips. The first step to a healthy pregnancy is ensuring you get high-quality prenatal care as early as possible. So, as soon as you discover you’re pregnant, be sure to call your doctor and arrange your very first prenatal appointment. Prenatal care is vital for the health of your baby as you’ll be screened to check whether you have any conditions which could cause potential complications. You’ll also need to let them know whether you’re taking any current medications. It’s also important to note that you should take your time to find the right prenatal care provider. It is an important decision so you need to be sure you don’t rush into it. Ask family and friends for recommendations. Prenatal vitamins provide baby with essential vitamins and minerals they need for healthy development. Within the first month of pregnancy, baby’s neural cord develops and it needs nutrients such as iron, folic acid and calcium in order to develop into the spinal cord and brain – something prenatal vitamins have an abundance of. You can buy these vitamins online on Amazon, or your doctor may also be able to prescribe them. Some women find these vitamins make them feel a little nauseous. If you start to feel queasy after taking them, it’s a good tip to start taking them either with a light snack, or at night time. Some women also find chewing gum or sucking on a hard candy also helps to reduce the feeling of nausea. Keeping the body hydrated is essential during pregnancy. However, you’ll want to focus on drinking plenty of water and avoiding drinks containing caffeine, as well as artificial colorings. It’s advisable to make sure you’re drinking around 8-10 glasses of water each day. It’s tempting to skip a few glasses as pregnancy does tend to make you urinate more frequently so drinking more water seems like a bad idea. However, it’s partially for the reason you do urinate more frequently that you need to keep your hydration levels topped up. You’ll also want to avoid alcohol for the duration of the pregnancy. While it is generally safe to consume a tiny amount of alcohol while pregnant, such as the odd glass of wine, it is strongly advised against if you feel you can hold off for nine months. One of the great things many women look forward to during pregnancy is “eating for two”. However, did you know you should only be eating approximately 300 extra calories each day? In terms of what you should be eating, a healthy and balanced diet is key, but there are certain nutrients you’ll want to focus on. Protein is a good example, as during pregnancy you need to start consuming around 70g of protein instead of 45g. You’ll also need to ensure you meet your recommended daily calcium intake. As well as focusing on what you’re eating, you also need to pay attention to how you cook it. Eating any raw foods (besides fruit and vegetables) can be really harmful to baby. Undercooked and raw eggs, seafood, juices and meats can contain bacteria which will harm your little one. So, make sure all foods are cooked thoroughly. Some experts suggest pregnant women should be eating five or six balanced meals each day, rather than the three large meals most of us consume. It’s understandable you might feel a little uneasy about exercising when you’re pregnant. However, provided you follow strict guidelines, exercising is actually really healthy for you and baby. There are specialist prenatal exercise classes you can attend which focus on safe, gentle exercises. Walking is also a great gentle exercise you can do to keep fit. Just 15-20 minutes each day is all you need to feel fantastic. Not exercising is one of the biggest mistakes women can easily make during pregnancy. As you’re eating more, exercising will ensure you don’t gain too much pre-baby weight, which in turn will help you to feel healthier and happier both during and after the pregnancy. It’s important to note here that you should get approval from a doctor before embarking on any exercise program. They will be able to advise you on which types of exercise are better and whether there’s any reason you shouldn’t exercise while pregnant. While exercising gently throughout your pregnancy is advised, it’s also important to ensure you get plenty of rest too. In some cases, rest is unavoidable and your doctor may even prescribe bed rest if you have high-blood pressure or there’s a medical reason you need to rest more than the average pregnant woman. Sleep is especially important, but it can be difficult to get a good night’s sleep when you’re pregnant. Whether it’s frequent trips to the lavatory or you develop bad heartburn during the night, there’s a lot of things that can interrupt your usual sleep routine. In these cases, it may be a good idea to try and sneak in a nap the day after. If you’re experiencing regular sleep troubles however, it’s advised you speak about it with your doctor and see what help is available. Resting will give your baby the best chance of developing healthily and it will also limit your stress levels. What better way to relax during pregnancy than visiting your local health spa? However, there’s a few treatments and facilities you’ll actually want to avoid. The Sauna and hot tub, for example, can both be detrimental to your baby’s health. This is because they can cause the body to overheat pretty quickly. The American Pregnancy Association claims that just 10-20 minutes sitting in a hot tub can cause the body’s temperature to increase up to 102 Degrees Fahrenheit. This is just about safe for pregnant women, but any longer and your temperature could reach dangerous levels. You’ll also need to be wary of any essential oils you come into contact with. Many women are unaware that some essential oils can trigger uterine contractions during the first or second trimester. Just some of the oils you’ll want to avoid include clary sage, juniper and rosemary. It’s best to talk to the therapist to ensure any oils being used are safe for pregnant women. Putting together a birth plan is extremely important. Very few babies are born on their actual due date. So, if you leave the birthing plan until the last minute, you could be caught off guard if your baby decides to make an early appearance. The birth is a stressful and anxious time and if you don’t have a plan in place, things can go wrong. So, think about the type of birth you’re hoping to have. Add any specific instructions you want your birthing partner to follow and if you already have children, decide whether or not you want them present on the day of the birth. Some other useful things you’ll want to think about include whether there’s any procedures you’d prefer to avoid, what kind of pain medications you want and if there’s any particular clothes you’d prefer to wear. Be as detailed as possible in your birth plan, but remember, things won’t always go according to the plan! Not all pregnant women develop unusual cravings, but if you do, don’t deny them! As long as you’re eating a mainly balanced diet, it’s perfectly fine to enjoy the odd indulgent craving. Most tend to consist of ice cream, pickles or some pretty unusual food combinations. However, if you find your cravings are a little more bizarre, it could be time to head to the doctor. A lot of pregnant women experience non-food cravings such as chewing on a new sponge or eating charcoal. Some even love the smell of dust particles. They may be humorous, but non-food cravings can actually be a sign of a condition known as “Pica”. Eating the non-food items you’re craving can affect yours and your baby’s ability to absorb nutrients, as well as contain potentially harmful chemicals. So, if your cravings are food related, don’t feel guilty about giving into them. However, be sure to visit the doctor if you start craving non-food items. One of the most embarrassing and frustrating problems pregnant women face is bladder weakness. It’s unsurprising considering you now have a baby pushing onto your bladder! However, there is a way to reduce the discomfort and strengthen those pelvic floor muscles and that’s via Kegel exercises. Kegel exercises won’t just strengthen the muscles associated with urinating, but they’ll also help support the uterus and bowels too. If you can do them correctly, they may even help with the birth. The great thing about this type of exercise is the fact it can be done absolutely anywhere and nobody can tell you’re even doing them. Take a look online and you’ll find detailed instructions of how to do Kegel exercises correctly. Alternatively, if you’re going to prenatal exercise classes, the teacher may naturally incorporate Kegel exercises into the routine. Did you know that the size of your feet can change during pregnancy? Even more surprising, is the fact the feet can permanently change size after pregnancy too. This is because if there’s too much pressure placed upon the feet during pregnancy, it can cause them to permanently flatten out. As you naturally gain weight, especially water weight, your ankles may start to swell and your feet may become larger. So, it’s a good idea to invest in new shoes the minute you start feeling your current ones becoming too tight. If you invest in larger, more comfortable shoes now, you may be able to prevent your feet changing size permanently. When you’re pregnant, the skin becomes more sensitive to the sun, putting you at a higher risk of chloasma and sun burn. So, if you’re heading out, be sure to wear sunscreen. Ideally it should be at least 30 SPF and you can even find brands which produce chemical-free ingredients. It’s also a good idea to wear sunglasses and a hat for added protection. You’ll also want to avoid using tanning beds. There isn’t any concrete evidence that tanning beds can harm your baby, but the American Pregnancy Association advises against using them. Wearing a seatbelt whilst you’re pregnant isn’t exactly comfortable, but it is necessary for the safety of both you and baby. Just be sure you’re using the correct positioning and you’ll be adequately protected. The National Highway Traffic Safety Administration recommends having the shoulder part of the seatbelt, across the collarbone. The lower part of the belt should be secured below the abdomen. Try and position the lower part as low down as you can and never place it above the abdomen. It’s also important to sit far enough away from any airbags if possible. When baby arrives, you’re going to be left with very little time to focus on yourself. So, take some much-needed time out to treat yourself. Spend time doing the things you really enjoy. Listen to calming, happy music, catch up with friends, read a book, have a manicure- now is the perfect time to do anything you love to do. This won’t just be good for you – it will be great for baby too. Finally, one thing you’ll want to do is research as much as possible. Read baby books, look at articles online and join our parenting forum. You’ll want to gather as much information and tips as you possibly can. However, it’s also important to note that no matter how much research you do, it’s never going to fully prepare you for the journey ahead. It does give you a head start though! Overall, the key to a happy, healthy pregnancy is to limit the amount of stress in your life, eat a healthy diet, exercise gently and educate yourself as much as possible about pregnancy, the birth and baby’s first few months. The tips above will really help you to give your baby the best start in life. Remember, if you experience anything you’re concerned about, such as twitching, pain or bleeding, don’t hesitate to contact a doctor. Even if it turns out to be nothing, it’s better to be safe rather than sorry. Bleeding During Pregnancy – Should You Be Worried? Great article! It hadn’t occurred to me that the spa could be so dangerous to a pregnancy and that pregnant mothers would have to take such care to avoid overheating and essential oils! Yes, a spa seems to be a harmless way to get rid of the body aches during pregnancy but apparently it’s not. Certain oils are particularly a no-no because it can bring about contractions. In fact, doctors do not recommend the use of any liquid on the body that has harmful chemicals because it can penetrate the skin and affect the unborn. Awesome tips on having a good experience during pregnancy. Having good rest during this period is one thing every pregnant mom should consider for doing so will help the baby in the womb to feel calm as well. Great to read that taking lots of water can be helpful as well. Yes, Henrywrites, a pregnant woman needs to take lots of water to avoid dehydration which can be caused by frequent urination. And this is true for everyone – we all need to drink 8-10 glasses of water every day because it’s good for the body. When my wife was pregnant, we did a lot of research and sincerely followed the tips from the reputed sources. When wife tested positive, the very next day we went to the Obstetrician. My wife began using prenatal vitamins and other supplements. She avoided junk food and carbonated drinks. In fact, my wife followed all of these tips. That’s wonderful to hear, vinaya! Your wife did a good job. That only means she truly cares for your child because she followed all the tips to ensure she gives birth to a healthy baby. Pregnancy is a really serious state so this should be read by those mom who become pregnant for the first time. Every mothers dream is to make their pregnancy very healthy because if not they are risking the babies life in her tummy and risking her own life too at the same time. So every mother should take all of this tips to have a healthy pregnancy. True, Dictatory20, every mother prays and hopes for a healthy baby so a parent who loves her child should not eat or drink anything that is prohibited during pregnancy. These prohibited items could bring harm to a baby and I’m sure no well meaning parent would want that. This is a great article. I would like to add some details too how to have a healthy pregnancy base on my experience. To those pregnant women out there, if you have personal problems or hatred please release it freely. Stress can harm your baby too. Stay happy and don’t mind problems so the baby won’t get stress. Remember the baby can also feel what you feel. Follow those steps mention in this article because it was all true and always pray to God to guide you and for your safe delivery. Enjoy your pregnancy with your husband or family. Well, my wife and I will soon plan to have a baby and this is a very good article, to begin with. Nice idea of how things were done. Thank you very much for the lovely feedback, Clarence. We truly appreciate it. Glad to be of help. Pregnancy indeed, a very crucial but exciting feeling a woman could ever experience. The moment you decided to bare a human being in your womb, you should be prepared and most of all you need to be strengthened. But all those pains, sleepless nights and morning sickness will surely be worth it until the day a healthy and beautiful angel will be delivered. So I am recommending this vital tips for you to have a very healthy pregnancy which I also experienced 1 year ago. So true, French. All the pain and sacrifices a woman has to bear will all be worth it once she sees the little angel. One thing I think they really should have mentioned under birth plans was to expect things to not go according to plan. Sure, they may, but it is also ok if you decide to opt for that epidural after all, or if you need an emergency C-section it doesn’t mean you failed. Sometimes being too concrete in your birth plan can be detrimental and may lead to PPD if things didn’t go the way they were planned. There is no right or wrong way to give birth as long as baby and mother are well cared for! You’re right, things will not always go according to plan. Pregnant women and their spouses/partners must be flexible with their plan or have Plan B or C just in case Plan A doesn’t work. Whatever plan works, it will always be for the welfare of the mom and baby. These are great tips and I thank you very much for this article. I and my wife are planning to have our second baby next year and we will definitely take this advice this time. To be honest, we missed a couple of things that we should have considered at first when we had our first baby. I am so much interested in kegel exercise and I definitely will do some research about it to apply it next time. We are going to take note of the regular exercise as well.